When it comes to Texas BBQ, Hill Country, Austin, and the like get their share of well-deserved respect. But guess what, world? H-town is comin’ at ya, and we play for keeps. 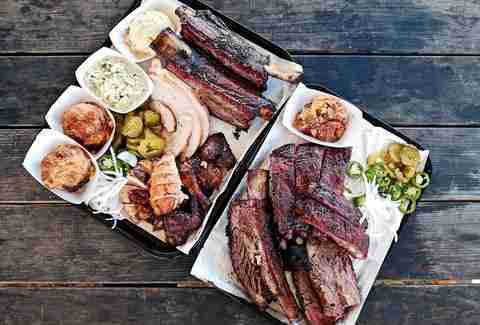 Houston’s been quietly stepping up its ‘cue game, meaning that it’s our time to shine... once we clean ourselves off with some napkins. Here are the 11 finest examples in town. If there's one reason, and one reason only, to take the ride to Pearland, it’s to eat at chef Ronnie Killen’s namesake smokehouse. On top of the killer barbecue, the venue makes just about every list we have. Killen, who has both training at Le Cordon Bleu and experience at a booming steakhouse under his belt, takes care to make sure that every pound of brontosaurus-sized, salt-and-pepper-kissed beef ribs; tender, fatty brisket; and snappy, juicy, house-made links exceeds Texas standards. It does. Go for the smoked meat, but don’t miss happy surprises like the insanely good fried chicken, or brisket tamales. With a sparkling new facility on Ella that happens to be about six times the size of its shuttered 19th St location, this family-run fan favorite literally is bigger and better than ever. You can still get owner and pit boss Greg Gatlin’s trio of smoked ribs (there’s a short and meaty baby back varietal, a St. Louis-style spare rib, and a megaton beef number). But this time, you won’t have to wait outside in the parking lot. Engage your inner caveman and gnaw it down to the bone -- or get the off-the-menu, fully loaded "kitchen sink" sandwich and finish the meal with a giblet-laden dirty rice so filthy you’ll need a cold shower afterward. 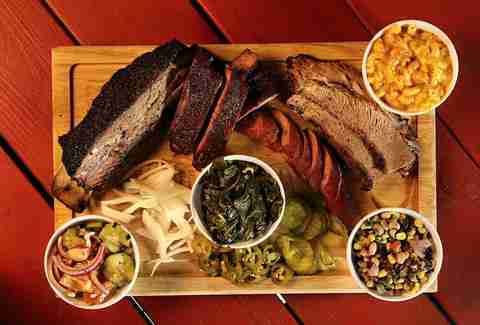 At long last, Downtown has a hot barbecue spot -- and it’s a smoking gun. While ‘cue king Greg Gatlin was readying his namesake Oak Forest haunt, he wisely spent his time on this ballpark-side grand slam with chef Bryan Caswell (of standbys Reef & Little Bigs). Head here for a trinity of masterfully smoked brisket, ribs, and German-style sausage; napkin-required yardbird; and sides that’ll make you swoon, like the fried mac or dirty rice. This fairly new smoked-out pop-up is so stupid good, it’s crazy to think that the people behind it all have other FULL-TIME jobs. Brothers Robin and Terry Wong own and operate the popular Glitter Karaoke, and chief smoker Quy Hoang co-owns an aquarium shop with his uncle. The magic started when the trio got together for a Glitter Karaoke steak night about four years ago. Two years later, Quy bought a smoker, and this passion project blossomed into a booming side biz that pumps out around 200-250lbs of smoked perfection at each pop-up. Hit the Beats + BBQ + Brews (every second Saturday of the month) at Lincoln Bar & Kitchen to feast on behemoth 44 Farms brontosaurus ribs, smoked boudin, and gochujang beef belly burnt ends. You probably wouldn’t think a BBQ joint in a strip mall would deserve mention. But this unassuming spot from owner Wayne Kammerl is worth a second look. He got his start at a smokehouse in College Station before relocating to Houston, but he brought his love for Ruffino Meats sausages with him. Those special-blend sausages star in the PB&J sandwich -- don’t worry, there’s no peanut butter and jelly involved. 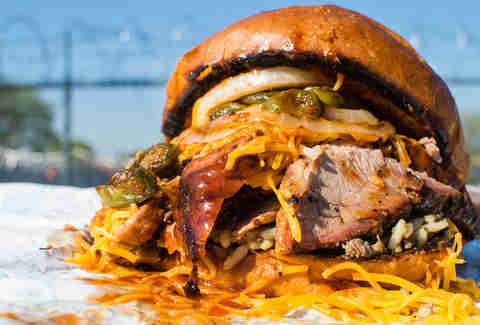 Instead, it’s a pulled pork, brisket, and jalapeño sausage number that’s not to be missed. Neither is the 1lb special, in which you get a full pound of your choice of up to four meats, including 16-hour oak-and-pecan-smoked brisket, pork ribs, chicken, and sausage -- all of which sit glistening on a sheet of butcher paper alongside a slab of cheddar, hot pickle, onion, and a fair amount of bread. Look out for a new Cypress Creek Pkwy location opening soon. 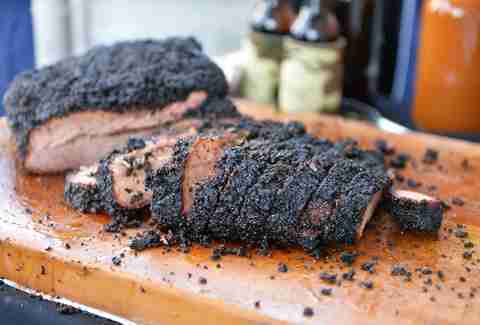 Helmed by married duo Russell and Misty Roegels, this cult favorite brings the heat with its incredibly smoky, fat-capped brisket, which comes complete with a gorgeous, crusty, jet-black bark. 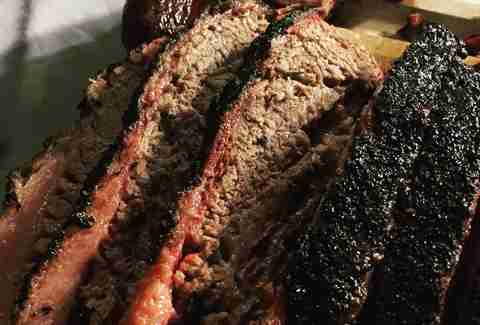 In just a short time, it’s become known as some of the best brisket in town, even earning the smokehouse a spot on Houston Chronicle’s coveted Top 100 list in 2015. But that’s not to say the other meats aren’t up to par. Get the smoky excellence in the form of fiery jalapeño links, lamb “pops” (on special on Thursdays), or soon-to-come projects like mammoth pastrami beef ribs. Pair it all with Misty’s homey sides, and you'll feel like you’re suppin’ at mamaw’s. Gone is the pink-and-black trailer. In its place is a pink-and-black brick & mortar. But while the space is slightly bigger, this spot, co-owned by married all-stars Will and Nichole Buckman, may still be liable to sell out of a few items on late Saturday afternoon. People know it's just that good. 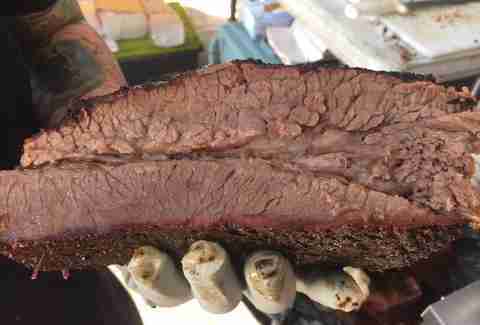 With a silky, perfectly rendered cap and crusty, blackened bark, the moist brisket here is one of the finest BBQ specimens in Houston. Get to Spring to blissfully destroy some, alongside stupendously blistered ribs, overloaded taters, and snappy pork sausage. Question: why would you go to Cypress? Answer: to absolutely smash some of Trent Brooks’ mind-numbingly delicious, smoldering slabs of smoked meat. 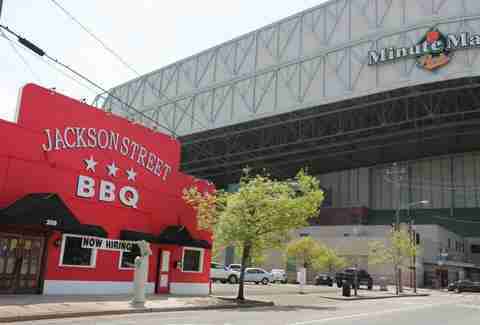 The consistent, quality ‘cue garnered Brooks high praise among Houston’s BBQ aficionados. Come for crusty, still-jiggling brisket, bigger-than-your-bicep beef ribs, and sweet specials like smoked catfish. If you’re craving carbs (and who isn’t? 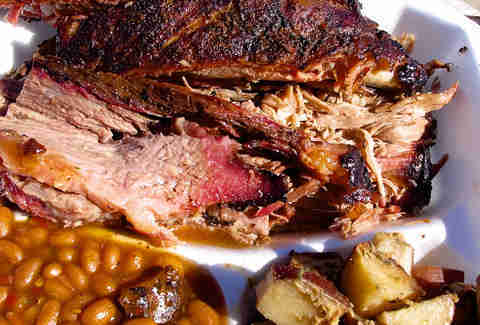 ), a juicy, sloppy pulled pork sandwich on a soft, buttery bun will do the trick. This young gun has a Heights-area brick and mortar opening in the spring. Until then, you can hit their pop-ups to sink your teeth into native smokemaster Grant Pinkerton’s wonderfully luscious Central Texas brisket, aggressively rubbed beef short ribs, Louisiana-style boudin balls, and jambalaya made daily. Finish it off with a from-scratch cobbler even your grandma would admit defeat to. After running a booming BBQ trailer at Jackson’s Watering Hole, pitmaster Wes Jurena branched out into a brick-and-mortar of his own last year. Now you can appreciate the art of gorgeously burnt 44 Farms brisket, shimmering pork ribs, peppery smoked turkey, and five-cheese mac on Jurena’s home turf. But it’s not just grade-A takes on the standards. You’ll find things like Caribbean jerk-style tri-tip and the glory that is the 1836 -- a pulled pork, chopped brisket, and sliced sausage sandwich with a slap of coleslaw. This NKOTB, on the radar of smoked meat fans thanks to barbecue guru JC Reid, thinks “you deserve good BBQ.” We tend to agree. Good thing truck driver-turned-pitmaster Steve Garner ensures you get just that. His house-made East Texas-style boudin is the kind of stuff fat kids’ dreams are made of. 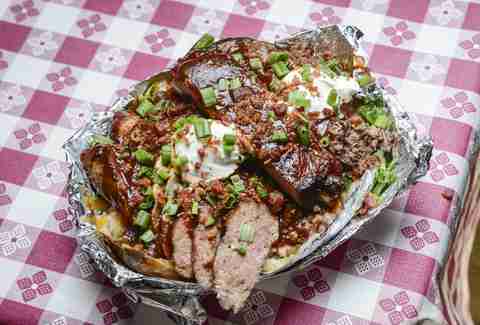 The messy slow-smoked pork ribs, generously seasoned brisket, and crazily stacked Big Poppa loaded baked potatoes are equally impressive. We’d give Garner a nice big pat on the back, but then we’d have to wipe the meat candy off our hands... and we’re kind of saving that for later.